"Life's an illusion love is a dream. 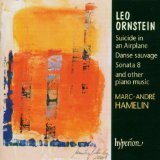 But I don't know what it is"
Leo Ornstein: Piano Music (this album) (2002). Sorry, no matches on eBay for "II. A Trip To The Attic - A Tear Or Two For A Childhood Forever Gone: A Half-Mutilated Cradle - Berceuse Hamelin".